Monsoon Academy in partnership with SAP Education Asia Pacific brings you SAP eAcademy. Being an authorized SAP education partner, Monsoon Academy has been helping hundreds of students from all walks of life to embark their SAP career journey through this latest flexible learning program. Whether you are still studying, currently working a full time job, or still discovering opportunities this program is suitable for you as a start for your SAP professional journey. At Monsoon Academy, our students NOT ONLY gets a E-Certificate of Attendance or E-Certificate of Completion from SAP, but this program leads our students towards the SAP Associate Consultant Certificate, which is issued directly by SAP head quarters in Germany. This certificate is your passport to start your career in the SAP ecosystem. 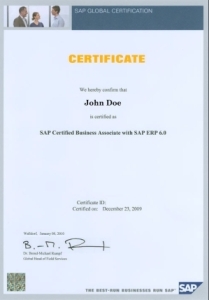 Achieve expertise in specific SAP solution areas. Prepare for a certification exam. Whether you are a student, or already working full time, or already an SAP consultant, or even still discovering various opportunities, SAP E-Academies will allow you to learn whenever and from wherever you want. Monsoon Academy has been in the SAP/ERP education business since 2008. We have been shortlisted for the "community impact" award by the Talent Unleashed Award. We are also the Best SAP Education Partner award winner in 2012. Our reputation is well known through client and student testimonies and videos. Please feel free to browse around our site for more information about SAP training and Monsoon Academy. Alternatively, you can contact our friendly representatives to arrange an information session regarding your SAP needs. We can provide solutions to your SAP training needs for personal, corporate, and institutions.